While all of your sales and marketing activities are closely tracked and measured, events aren’t held to the same standard. We’ve spoken to so many companies that rely on how an event ‘felt’ as their primary measure of success. It can be difficult to measure your company’s performance at each event, but it can be done. Event metrics are so important, for justifying budgets and measuring the ROI of your event. So here are five simple metrics to help you measure the success of each event you go to. At your events, are you getting a lot of sales qualified leads? Or just people who are only showing vague interest in your business? For one of our customers, the number of SQLs generated is the key metric they use to measure their events. Because the events they exhibit at are so large (and in-demand), they often need to start planning and booking their space soon after the event. This means they can’t wait for months to see how many leads turn into paying customers. They need an instant figure to benchmark the success of the event. Tracking your leads by lifecycle stage is a quick way to get an at-a-glance understanding of how successful your event was, before enough time has passed to complete any deals. When you’re looking for a quick indicator of event success, the number of leads collected is a good start. While it’s a bit of a ‘vanity metric’, it’s a simple way to benchmark the success of your events. You can break this down further by categorising leads depending on how good a fit they are. Think ‘hot’ or ‘cold’ leads. An event where you get a smaller number of leads in total, but a higher percentage of ‘hot’ leads, is still a good investment of time and energy for your business. It may even be a better use of time than exhibiting at an event where you come away with hundreds of leads, but they’re all a poor fit for working with you. Tracking email open and delivery rates will give you an early indicator of the quality of the lead data you capture at each event. If you have a high percentage of emails that hard bounce or go unopened, this points to inaccuracies in your data, or that you collected poor-fit leads who aren’t interested in engaging with you beyond a quick chat at your event space. It’s a good metric to keep an eye on – particularly if you hire badge scanners or lead retrieval devices as your primary method of lead capture at events. With a badge scanner, you’re relying on the quality of the data attendees provided the event organiser with. This is often full of holes, typos or missing fields. For example, I was at an event recently and spoke to a fellow exhibitor, who admitted using a generic email address when registering for the event, to avoid all the follow-up emails after. If that’s how exhibitors are behaving, it’s likely attendees have done similar things. Once the event is over and your initial follow-up emails have gone out, it’s important to track the response rate you get for these emails. This will help you assess how engaged your leads are after the event. When it comes to event follow-up, timing is everything. The longer you wait between speaking to a lead at an event, and reaching out to continue that conversation, the less chance you have of ever hearing from that person again. So you might also want to keep track of your sales team’s initial follow-up time, so you can see for yourself whether more time between event and email affects the number of responses you get. You won’t be able to track this immediately after the event, but is definitely worth tracking in the long term. This will help you make that crucial decision as to which events are worth exhibiting at next time around. If you’re spending tens of thousands to be at an event, but get only a handful of poor-fit leads – none of whom ever turn into paying customers for your business – then it’s likely that event isn’t a good fit for your business. Once an event is over, it’s worth periodically revisiting the numbers, to check if any new deals can be attributed to a particular trade show or exhibition – perhaps on a monthly basis. 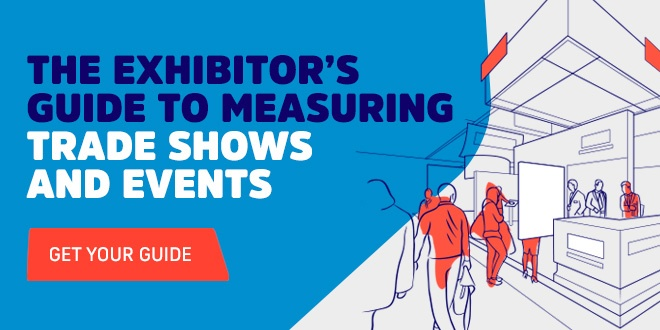 This is the ultimate long-term measure of event ROI, so this final metric shouldn’t get forgotten once you’ve moved on to planning and exhibiting at other events. With all the tools and technology available, it’s hard to believe we still rely on something as imprecise as your ‘gut feel’ for assessing how successful an event was. Especially when businesses invest huge sums of money to be there. Events are your only chance to get face-to-face time with prospective customers. Don’t waste your team’s valuable time and energy going to events that only deliver poor-fit leads. By tracking these five metrics, you’ll be able to make real, informed decisions about which events are worth investing in, and which don’t deliver the value you need.